The voting rights discussions across the United States in 2016 have been dominated by the presidential election. Beyond the race for president, the entire U.S. House of Representatives and one-third of the U.S. Senate are up for election. The basic details of each office and current party composition are outlined below. In addition, follow links to interactive maps to explore the outlook for these elections. In order to win the presidency, candidates must get at least 270 electoral votes in the general election in November. 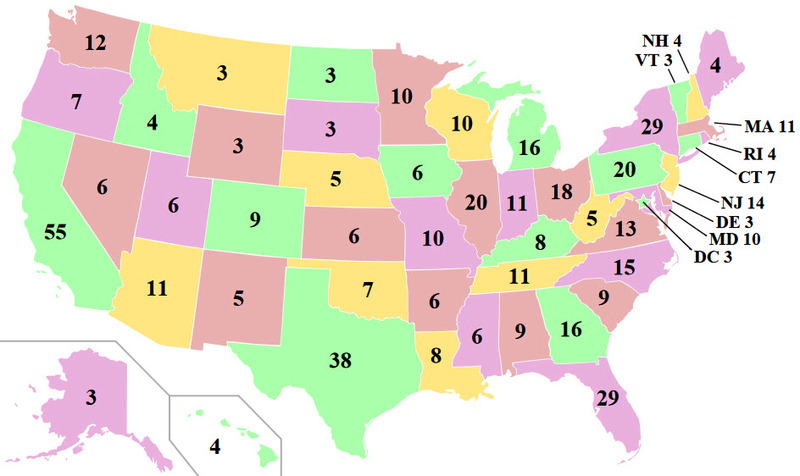 The electoral votes are proportionally distributed across the 50 states and Washington, D.C.
Use this interactive map from the website 270towin to see possible combinations of electoral votes and the associated outcome for 2016. Major-party candidates will be chosen at party conventions where nominations and party platforms are announced during multi-day events. Each state has two senators, equaling a total of 100. Because Senators have a 6-year term, one-third of the 100 Senators are elected every two years. This interactive map shows the 2016 Senate races and the party balance and potential changes. Each state has a number of representatives based on state population, ranging from one (seven states) to 53 (California) and totaling 435. Minnesota has 8 congressional districts and therefore 8 representatives. Representatives have a 2-year term in Congress, meaning that the entire body is re-elected every even years. Because of this frequency as well as issues surrounding gerrymandering, many races are uncontested or not very competitive. Use this map to see the competitive House of Representatives races and possible outcomes for 2016.